A two-year mystery involving the disappearance of at least 10 winter coats—twice from one woman—was seemingly solved last week by the Bend Police Department. A 51-year old Bend resident, Mark Mahoney, was arrested and lodged at Deschutes County Jail on Nov. 7 for allegedly stealing—and keeping—high-end winter jackets, mostly from within the Barber Library at Central Oregon Community College. Not for apparent resale, but for "sexual gratification," according to a written press release from Lieutenant Clint Burleigh of Bend PD. Michael Mahoney, 51, of Bend Oregon. On Nov. 8, Bend Police recovered several of these reportedly stolen coats from inside a SE Bend home and the suspect’s vehicle, including two different jackets stolen from the same female victim. Mahoney admitted to stealing the coats and was arrested and charged with three counts of Theft in the Second Degree and two counts of Criminal Mischief in the Second Degree with bail set at $25,000. 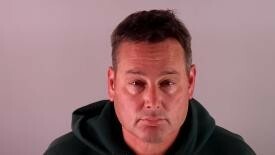 He is not currently listed in the inmate list at Deschutes County Jail. The thefts occurred as far back as November 2015 with the most recent incident reported on Nov. 7. Though mostly occurring from within the COCC library, one jacket was identified as having been stolen from OSU-Cascades in April 2017. Bend PD asks for anyone who has had similar thefts to report the incident to their non-emergency number at 541-693-6911.